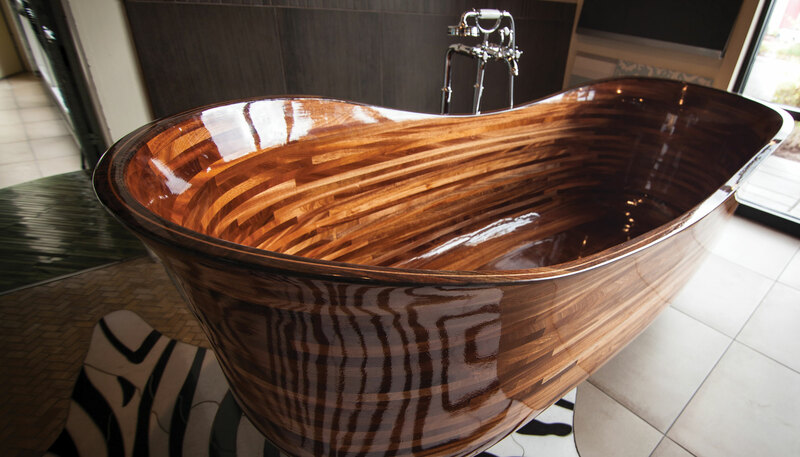 Award-winning Seattle design studio NK Woodworking crafts one-of-a-kind bathtubs from domestic and exotic hardwoods, finished with a durable marine varnish. Artistry and comfort combine to spectacular effect in NK Woodworking and Design’s (South Park, 1605 S 93rd St., Unit EG3; 206.486.3600) custom-made wooden bathtubs (from $30,000). Sapele mahogany is the popular wood of choice—shaped by hand using techniques employed by founder and lead designer Nathie Katzoff—and it insulates far better than typical porcelain or metal tubs, keeping bathwater warmer for longer. Each tub takes hundreds of hours to craft, and gleams with a composite finish that has its roots in boatbuilding; Katzoff’s background includes woodworking and restoration for a shipwright. “We aim to be the Steinway or Maserati of bathtubs,” he says, by taking luxurious baths to the next level.